This is my handling of R. C. Buffs "Paper Napkin Vanish," which appears in J. G. Thompson, Jr.'s book "My Best," on pages 157, 158. This is a fine impromptu stunt for children and adults. While seated at a table, open a cocktail napkin and hold it as in Photo 1. Now run your right hand down over its length several times, stroking it as you would a silk handkerchief. Now make the following remarks: "It's wonderful the modern kitchen appliances we have these days to make our homes more comfortable. We have microwave ovens, electric can openers, but there is a kitchen appliance that not everyone has in their home. Do you know what that is? A trash compactor! I carry my own trash compactor with me." As you are reciting these words, grip tightly with your left thumb and forefinger, at the same time closing middle, third and little fingers into your palm. Push forward with the thumb and forefinger. 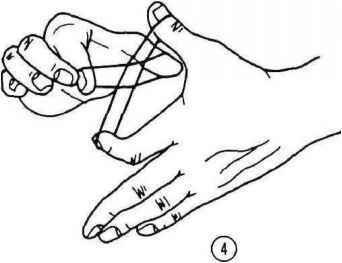 This action will tear the napkin at the thumb and forefinger as in Photo 2. Now, with the right hand, start at the bottom and roll up the napkin in a ball toward the left hand. Crumble the napkin into a tight little ball in the left hand and open the left fingers to show. (See Photo 3) Notice that your left thumb hides the break in the napkin. Pick up the pellet with your right first two fingers and thumb to show it around. Now pretend to place the pellet back into your left. 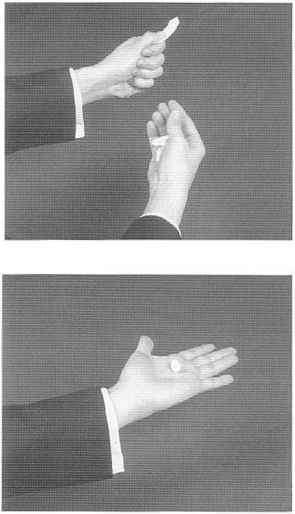 Bring your right hand to the table edge and lap the pellet as you extend your left hand over the center of the table. Bring your hands together, one above the other and 'pour' the invisible pellet from hand to hand. Slowly open both hands as you continue the 'pouring' process. Show the napkin completely vanished as you say, "I would be handy to have around the house. I'd eat you out of house and home and clean up my own mess." I give Jack Chanin credit for this, (as well as the prior effect,) even though the trash compactor idea and presentation and handling are mine. 1 saw Jack perform the R. C. Buff version back in the early sixties.